It is almost 100 years since Captain Scott and his party perished in the Antarctic, 29th March 1912 actually, and to commemorate that Old Macdonald has turned his farm into a Captain Scott theme park, with freezing ground and snow! To pay tribute to his epic and sad last journey we have been standing outside shivering in the cold and have also built a hut to resemble Scott’s, except with brand new play equipment and lots of fun and games for children which the old explorers never had. Sorry, we are just being a bit silly here and trying to combine two stories in one. On our main website www.omdfarm.co.uk/blog you will find out about our new play facilities as well as lots more news about your favourite animal park too, and on this page we commemorate Captain Scott. Very brave groups those old explorers, walking miles through the barren wastes, which is a bit like waiting for trains when it is a bit parky here. Robert Falcon Scott, CVO (6 June 1868 – c. 29 March 1912) was a Royal Navy officer and explorer who led two expeditions to the Antarctic regions: the Discovery Expedition, 1901–04, and the ill-fated Terra Nova Expedition, 1910–13. During this second venture, Scott led a party of five which reached the South Pole on 17 January 1912, only to find that they had been preceded by Roald Amundsen‘s Norwegian expedition. On their return journey, Scott and his four comrades all perished from a combination of exhaustion, starvation and extreme cold. Scott did not know that he would be in a race until he received Roald Amundsen’s telegram in Melbourne, in October 1910. Before this, he had set about fashioning the expedition according to his own preferences, without the restraints of a joint committee. So far as transport was concerned, he decided that dogs would be one element in a complex strategy that also involved horses and motor sledges, and much man-hauling. Scott knew nothing of horses, but felt that as they had seemingly served Shackleton well, he ought to use them. Dog expert Cecil Meares was going to Siberia to select the dogs, and Scott ordered that, while he was there, he should deal with the purchase of Manchurian ponies. Meares was not an experienced horse-dealer, and the ponies he chose proved mostly of poor quality, and ill-suited to prolonged Antarctic work. Meanwhile, Scott spent time in France and Norway, testing motor-sledges, and recruited Bernard Day, from Shackleton’s expedition, as his motor expert. The expedition itself suffered a series of early misfortunes, which hampered the first season’s work and impaired preparations for the main polar march. On its journey from New Zealand to the Antarctic, Terra Nova was trapped in pack ice for 20 days, far longer than other ships had experienced, which meant a late-season arrival and less time for preparatory work before the Antarctic winter. One of the motor sledges was lost during its unloading from the ship, disappearing through the sea ice. Deteriorating weather conditions and weak, unacclimatised ponies affected the initial depot-laying journey, so that the expedition’s main supply point, One Ton Depot, was laid 35 miles (56 km) north of its planned location at 80° S. Lawrence Oates, in charge of the ponies, advised Scott to kill ponies for food and advance the depot to 80° S, which Scott refused to do. Oates is reported as saying to Scott, “Sir, I’m afraid you’ll come to regret not taking my advice.” Six ponies died during this journey either from the cold or because they slowed the team down so they were shot. On its return to base, the expedition learned of the presence of Amundsen, camped with his crew and a large contingent of dogs in the Bay of Whales, 200 miles (320 km) to their east. Scott refused to amend his schedule to deal with the Amundsen threat, writing, “The proper, as well as the wiser course, is for us to proceed exactly as though this had not happened”. While acknowledging that the Norwegian’s base was closer to the pole and that his experience as a dog driver was formidable, Scott had the advantage of travelling over a known route pioneered by Shackleton. During the 1911 winter his confidence increased; On 2 August, after the return of a three-man party from their winter journey to Cape Crozier, Scott wrote, “I feel sure we are as near perfection as experience can direct”. The march south began on 1 November 1911, a caravan of mixed transport groups (motors, dogs, horses), with loaded sledges, travelling at different rates, all designed to support a final group of four men who would make a dash for the Pole. Scott had earlier outlined his plans for the southern journey to the entire shore party, without being specific about precise roles – no one knew who would form the final polar team. During the journey, Scott sent a series of conflicting orders back to base concerning the future use of the expedition’s dogs, leaving it unclear whether they were to be saved for future scientific journeys or were to assist the polar party home. Scott’s subordinates back at base were unsure of Scott’s intentions, and consequently failed to use the dogs in a concerted attempt to relieve the returning polar party when the need arose. The southbound party steadily reduced in size as successive support teams turned back. 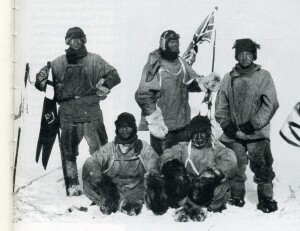 By 4 January 1912, the last two four-man groups had reached 87° 34′ S. Scott announced his decision: five men (Scott, Edward Wilson, Henry Bowers, Lawrence Oates and Edgar Evans) would go forward, the other three (Teddy Evans, William Lashly and Tom Crean) would return. The chosen group marched on, reaching the Pole on 17 January 1912, only to find that Amundsen had preceded them by five weeks. Scott’s anguish is indicated in his diary: “The worst has happened”; “All the day dreams must go”; “Great God! This is an awful place”. Scott’s group took this photograph of themselves using a string to operate the shutter on 17 January 1912, the day after they discovered Amundsen had reached the pole first. The deflated party began the 800-mile (1,300 km) return journey on 19 January. “I’m afraid the return journey is going to be dreadfully tiring and monotonous”, wrote Scott on the next day. However, the party made good progress despite poor weather, and had completed the Polar Plateau stage of their journey, approximately 300 miles (500 km), by 7 February. In the following days, as the party made the 100-mile (160 km) descent of the Beardmore Glacier, the physical condition of Edgar Evans, which Scott had noted with concern as early as 23 January, declined sharply. A fall on 4 February had left Evans “dull and incapable”, and on 17 February, after a further fall, he died near the glacier foot. With 400 miles (670 km) still to travel across the Ross Ice Shelf, the party’s prospects steadily worsened as, with deteriorating weather, frostbite, snow blindness, hunger and exhaustion, they struggled northward. 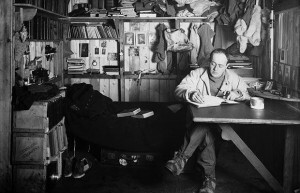 On 16 March, Oates, whose condition was aggravated by an old war-wound to the extent that he was barely able to walk, voluntarily left the tent and walked to his death. Scott wrote that Oates’ last words were “I am just going outside and may be some time”. Scott is presumed to have died on 29 March 1912, possibly a day later. The positions of the bodies in the tent when it was discovered eight months later suggested that Scott was the last of the three to die. Following the news of his death, Scott became an iconic British hero, a status maintained for more than 50 years and reflected by the many permanent memorials erected across the nation. In the closing decades of the 20th century, the legend was reassessed as attention focused on the causes of the disaster that ended his and his comrades’ lives, and the extent of Scott’s personal culpability. From a previously unassailable position, Scott became a figure of controversy, with questions raised about his competence and character. Commentators in the 21st century have on the whole regarded Scott more positively, emphasising his personal bravery and stoicism while acknowledging his errors, but ascribing his expedition’s fate primarily to misfortune. After all, we are all clever after the event and without the work of Scott and his team as well as other Arctic and Antarctic explorers, the vital research at both poles which is carried out today would not have happened and we would lose all the knowledge we have about climate change and loss of bio diversity. They were indeed heroes. By the way, have a look at the new BIAZA website www.biaza.org.uk, as it is brand new and full of fascinating information. Well worth 10 minutes of your time.